Bradley Corporation, a supplier of commercial restroom fixtures and accessories, recently invited me to tour their manufacturing facilities located near Milwaukee, Wisconsin. 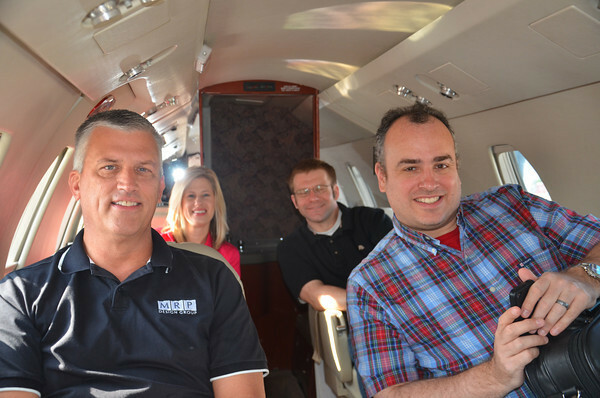 The trip included a flight on their corporate jet along with seven other attendees. It was great to travel without the hassle of security checks and standing in long lines to board your plane. After just an hour and a half in the air we touched down and were shuttled by a Bradley representative to their headquarters and fixture manufacturing plant. As our tour began I noticed a display fixture which I automatically assumed was a new product. I was quickly informed it was actually a group sink that had been put into operation back in the 1930’s. It was in great condition; a testament to the quality of Bradley’s products. Our tour included various workstations throughout the manufacturing process. We were all intrigued by the use of robotics at various stages. 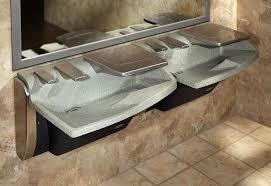 In one case it requires 6 hours of sanding to achieve the high quality finish on Bradley’s sinks. It takes the same amount of time whether this task is performed by a robot or a person. Since this particular step in the production line involves such repetitive movements, it’s easy for a robot to take over the role. It was encouraging to see a modern and efficient manufacturer located right here in the U.S.
Our initial tour concluded with a visit to the show room where various fixtures including the all-in-one Advocate sinks were on display. These sinks have an automatic soap dispenser, automatic faucet, and an automatic hand dryer all taking no more space than a typical sink. After a wonderful lunch at a local deli we headed to Bradley’s second manufacturing facility which produces restroom accessories including towel dispensers and handrails. One common concept between the two manufacturing plants was the start-to-finish process. The production process in each plant began with raw materials and ended with the shipping of finished products. 100% of the fabrication was completed inside these plants. At the conclusion of the second tour we were taken on a excursion through historic downtown Milwaukee where we experienced the architecture of the buildings and features of downtown area; obviously of great interest to this architect. Even our hotel was a converted old brewery complete with a display of the large, copper manufacturing tanks from its beer making days. Our evening included taking in a Brewers baseball game at Miller Park. The facility was a real showpiece and I was surprised at the large crowd in attendance for a Thursday night game. Anyone who follows baseball knows that the Brewers are having a tough time this season but you wouldn’t know it from the turnout. The team pride was obvious. We watched the game from great seats and enjoyed several brats, a local specialty. After a quick breakfast and another hour and a half flight we found ourselves back in Atlanta. I want to thank the Bradley Corporation for their hospitality during my visit. I certainly know a great deal more about this industry leading manufacturer and their ability to produce innovative products. With so many companies moving to overseas manufacturing it was encouraging to visit this thriving U.S. based plant.